United World Life Insurance Company is a life and health insurance carrier originally incorporated in 1970. They are probably most well known for their Medicare supplement insurance because they are one of the top providers of this type of coverage in the United States. They now operate as a wholly owned subsidiary of Mutual of Omaha. To that end, they do not maintain their own website or operate separate offices. If you’re in the market for competitive health insurance rates, why not start your search now by entering your zip code below? In addition to their Medicare supplement products, United World also offers specialized life insurance and accident policies. These are specialized policies intended for individuals with specific needs that may not be covered by standard policies. Such policies are generally considered supplemental insurance as a means of providing extra coverage not met by a customer’s other insurance coverage. At last count, Medicare had four different subdivisions, known as “parts,” which are intended to be covered by a variety of insurance providers. United World works within all of those subdivisions to provide the coverage appropriate for each individual. For example, Part D involves prescription drug coverage as instituted by federal legislation in 2007. Medicare recipients who need Part D prescription coverage can get it through a United World Medicare supplement. Furthermore, each of their supplements is designed to cover a specific area in which Medicare has a gap. For example, Parts A and B originate from the federal Medicare health program and cover such things as hospitalization and routine physician care. Where individuals exceed the limits of Parts A and B, United World provides gap insurance. Parts C and D are additional coverage regulated by federal Medicare laws but offered by private insurance companies. Part C is the Medicare version of a private HMO or PPO plan for seniors, while Part D is more or less prescription drug coverage. United World offers plans for Parts C and D.
Initiating claims with United World depends on the type of policy you’re talking about. For their Medicare supplements, there’s no need for policyholders to initiate claims on their own under most circumstances. Almost all participating doctors and health institutions bill Medicare or United World directly. If that is ever not the case, it’s probably because limits have been reached or the policyholder has utilized services from a non-network provider. Claims for other types of insurance policies would be made by contacting your local agent or calling the company’s claims service hotline directly. In either case, policyholders will be directed as to what type of information they need to provide, how to provide it, and how to track claims through their completion. Mutual of Omaha is such a large company that finding a local agent should not be a problem. The corporate website provides an online agent locator tool, which allows you to search by city and state. Just in New York alone, there are more than 65 different agents returned in our search. The only question remains as to whether or not all of these agents represent United World Life Insurance Company products. It may be that some agents only represent Mutual of Omaha and their subsidiaries in certain lines. For example, one agent may deal only in life insurance while another represents all of the products offered. The only way to know this for sure is to deal with independent agents on a case-by-case basis. Customers who wish to avoid the hassle can always call the corporate headquarters and ask for a specific agent’s name based on the type of insurance desired. 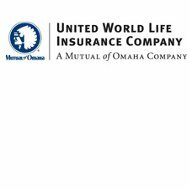 Mutual of Omaha and United World are always looking for new agents to represent them. If you are interested, they provide the appropriate contact information on the corporate web site. Search for health insurance rates from companies just like United World by entering your zip code below. Why did my cost jump from $98 to $221? I cannot pay this much on my income. I am to the point of groceries or medicine. Please help me. I called the number listed (844 603-3075) on this web site and it was not working / not connecting. I then called both of the help numbers on my UWLIK Medicare part G supplement cards and neither of them would connect to a person or service. I have been left with no way of getting information about my account or of having a plan established for my wife who is turning 65 this month. If this is the level of service I can expect, I am inclined to take my accounts elsewhere.